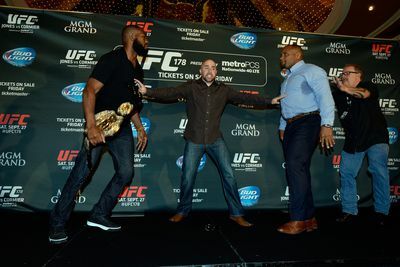 At 36, UFC light heavyweight champion Daniel Cormier can’t wait for Jon Jones forever. With Jones suspended and stripped of his title, Cormier has kept busy making sure he’s first in line when Jones returns. Speaking with UFC commentators Jon Anik and Kenny Florian, Cormier says he’ll be ready to redeem himself following his first career loss to Jones at UFC 182 in January. “I’ve said it before the [Gustafsson] fight. Everyone up here, me, Rashad Evans, Ryan Bader, Alexander Gustafsson, we’re fighting each other and we’re preparing but everybody wants that fight,” Cormier said of Jones. “Make no mistake about it. It’s a sweepstakes to see who gets that fight against Jones. I just want it to be me. I’ve long said that Jones is the guy that can really compete with me in this weight class. Obviously, he beat me.